There is a song of beauty in my heart for only you, my sweet Lady Flower. Walk with me among melted snow and feel the winds of freedom stealing the warmth from our hands, but setting ablaze the fire in our hearts. Your beautiful tresses against my face shield me from the desires of a stranger and your hand in mine reminds me of the gift of love I only feel when in your gorgeous presence. Remind me once again why you love me so much and then listen intently as my heart whispers my love for you in return. Do you know that treasures of the heart are greater than a kingdom without love and a rich man has nothing without the faithful love of a humble woman? My darling, with trembling lips I speak love to you and with a joyful heart, the song of beauty plays for you endlessly…doing so with the most harmonious melody upon the harp of my soul. As always, love is my inspiration and my guide. I exist in it shadow (smile). Thanks for stopping by. Another luscious poem from you. I hope that there is someone in your life who is the actual recipient of these sentiments and who reciprocates. Smiling...I am a very fortunate man to be wrapped up in the arms of love by someone who not only adores me, but is the muse & inspiration behind my sentimental expressions. Thank you for visiting & the kind words. Thank you Shreya. Nice of you to stop by. I really like that Bryan Adams song. Everything I do in life is fueled by love. When you have love in your heart, it can never be silenced. The love in my heart is expressed through my poetry. Thank you for the heartfelt sentiments. Always a pleasure to hear from you. LOL...yes, I read your rant & I agree with you on all points. I'm just glad that at least you like my music (smile). Thanks for taking the time to visit. I appreciate it. It's amazing the power of words, especially ones spoken in truth and love (smile). Thank you for taking the time to visit. Always a pleasure to hear from you. wow... such a nice feel... so romantic.. felt it buddy.. Your kind words are greatly appreciated. I hope you will stop by again soon. Beautiful. Just what I needed to set my day off in the right way! Thank you for starting your day with me. You're welcome to stop by anytime for a quick fix (smile). Thank you Alka. I exist in the shadow of love...it's what feeds my soul, my heart and the ink for my pen (smile). Thanks for visiting. Such romantic inspiration this morning! Thank you, Andy! As you probably know by now, my expressions from the heart are always inspired & fueled by love....the most priceless gift. Thank you for taking the time to visit. Thank you Autumn Eliza/ELLE. Nice of you to stop by. This piece is such a wonderful tribute to true love. You are the consumate romantic Andy. I hope you are compiling for a book. Thank you for the heartfelt sentiments. A book...hmm, now that would be nice. I have some ideas taking hold in my head. You will just have to wait & see (smile). Thank you for visiting & for the award. You're very kind & I truly appreciate it. Thank you, but I'm the fortunate one to be wrapped up in the beauty of love (smile). Nice to see you. Thanks for stopping by. So beautifully written...tugging at my heart strings romantic. Thanks for sharing your beautiful talent. I'm a man who writes from deep emotions. Love is always my guide & my inspiration. Thank you for the kind words. I appreciate you stopping by. Andy your words are put together like no other. It amazes me everyday how you can come up with poems of love. Hello Jan, I am consumed by love. I can't help it. I live for love. Love lives in me & refuses to be still. Love's voice is my voice & my poetic expressions. Thank you for always taking the time to read my sentiments. Always a pleasure to see you here. Thank you Anshul. Your visits & kind words are very much appreciated. The harp of your soul is making some beautiful music here. What a lovely thing to say Sue. Thank you. Your visit & comments are always appreciated. I almost missed this comment...for some reason it had ended up as spam. Good thing I check spam every now & then. This one speaks of a love that has endured the passing of time and the trials of life. You brought me to tears on this one Andy. So lovely. Thank you. Leah, Leah, Leah...what am I to do with you? I don't want you to be sad. Come, please dry those pretty eyes and just enjoy the beauty of love. Actually, a few months ago, I nicknamed myself "Doctor Love"...has a nice ring to it wouldn't you say (wink, wink, nudge, nudge)...there...I knew that would bring a smile to your face. Thank you for the heartfelt comment. I hope you will stop by again soon. Andy, you express all that your heart feels so beautifully! Always a pleasure to see your smiling face. Wow! 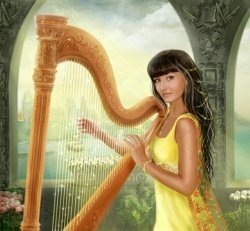 !1 Beautiful and melodious like the harp! Smiling...thanks Rimly. Means a lot. Happy to see you here. Thanks for visiting. I really LOVED the concept of "Harp of My Soul" and you chose the perfect image as always! Beautiful prose once again, Andy! The image is something, isn't it? It's my pleasure to add you to "Poetry Retreats" because I felt so bad about you losing your original spot in the "Top Whisperers" list due to the change in your name. Thank you for always being so king & generous with your comments. You're truly special. you are so lucky to have your own gym. I love it. I can exercise any time of day or night. No expensive gym membership fees. Wishing you well with Zumba, if you should decide to join (smile). Everything you have said here is the truth. I exist in the shadow of love. Love feeds my heart, my soul & is the ink for my pen. I am wrapped up in the arms of love everyday & I have to thank God for this blessing. Thank you for your gracious comments. It's because of readers like you that I am inspired & encouraged to continue writing & sharing my expressions of the heart. Thank you ♫♪♥PhilO♥♪♫. I appreciate the kindness. You always speak of love so eloquently and with such beauty. I am addicted to love...it's what I know, what I write about & who I am. For me, there can be no life without love. Nice to see you. Thanks for visiting. There is no greater gift we can be given than the gift of love. You have it in abundance Andy and you show it so well in your words. You have given me a wonderful gift with your kind words. For me, it's simple...I live for love. Love is the fire burning inside me & refuses to be still. That's why I keep writing...love has a lot to say (smile). Thank you for stopping by & for taking the time to comment. I truly appreciate it. "Remind me once again why you love me so much........" that line is so beautiful! Take care & thanks for visiting. Smiling...I didn't think anyone would notice that name! Nice of you to stop by. I appreciate the visit. Nice of you to stop by. Hope you'll visit again sometime soon! Congratulations on the Award. May you win many more accolades. You are indeed a master of romance & love. Everything I know, everything I write, everything I am all stems from love. When all life forms around us are withering & dying, love's warmth will remain eternal, for it cannot die at the doorsteps of death. Thanks for the kind words. I appreciate the visit. Thank you for visiting my site, I enjoyed your expression of love. Hello Wander. Welcome to my blog. Thanks for taking the time to stop by & read my poem. I appreciate your visit. Hope you will return again soon! Hello Tarunima. I haven't seen you for a while. How are you? You have a wonderful way of expressing things concerning love and I love your blog and reading it! I'm happy my blog & poetry are so appealing to you. Please don't hesitate to stop by again soon! And heartfelt congrats on the well-deserved award! Look forward to *seeing* you again soon - love yr blog! Thank you for the kind words & the congratulations. It's always nice to have ones's work appreciated. LOL...you'll definitely be seeing me soon...can't let Miss Jenny down! Smiling...you are very kind. always maintain that I'm the fortunate one to be wrapped up safely in the arms of love. Thanks for stopping by. Lovely to see you. Another loving embrace formed with words and sealed tight with longing. Lovely Andy. I appreciate the link too. I've already been over & have to commend you for baring your soul. Nice to see you. Looking forward to your return visit! This piece is delightful and heart warming, a great dedication to a love one that is near or far. Thanks for the lovely comment. You're very kind. Hello Melle. Welcome to my blog. You sound as if you're familiar with my poetry? Thank you for the kind words. They are much appreciated. I understand you are a very busy person, but I hope when you next get a chance, you will stop by again sometime. Gosh. I thought for a moment I was having a hot flash here, and then I realized it was just your heavenly words warming my heart! Thank heavens I won't have to change my estrogen prescription! Thank heavens we have these beautiful words to read each week. My favorite line started, "Remind me once again..."
You are wicked cool, Andy. I adore anyone who isn't afraid to wear their heart on their sleeve! Please accept my apologies for the lateness in replying. Most men don't know how or are afraid to openly express their innermost feelings, but you have certainly come to know that I am not like most men (smile). I exist in the image of love and it is love that speaks through my poetry. Thank you dear Jenny for your kindness. Your words play ever so gently on the harp of my soul (smile).